Expert Review of No-Drip Watercolors by Crayola, one of our picks of the top Jewish books for kids! 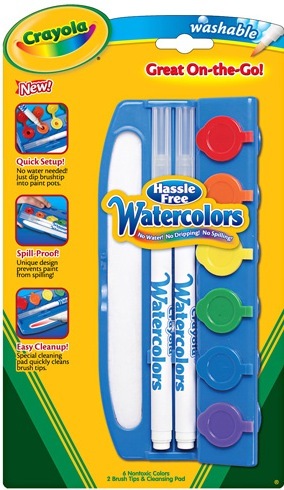 Crayola Hassle-Free Watercolors are like regular watercolor paints – without the mess. No setup needed. There are no cups of water to tip over and no paints to spill. The specially designed paint pots contain a bright solid color that is activated only when you dip in the brush tip. You can even turn the paints upside down and they won't spill or drip!